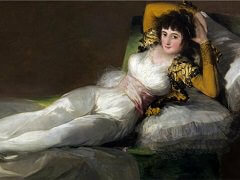 In 1824 Francisco Goya arrived in the city of Bordeaux as a self-imposed exile from Spain. He was seventy-eight years old, stone deaf (since 1793) and profoundly out of favor with a political regime that had been his essential form of support. 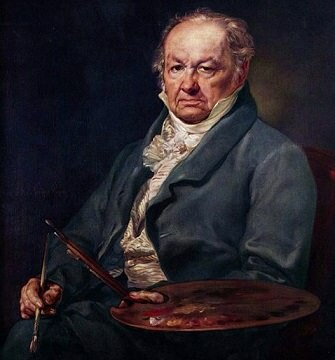 "Goya in fact arrived, deaf, old, awkward and weak," his old friend and protector Leandro Fernandez de Moratin reported in a letter back to Madrid, "and without knowing a word of French and without bringing a servant (that no one needs more than he), and so happy and desirous of seeing the world. "3 He would live four more years, long enough to return briefly to Madrid to gain his official release with full pension from his post as Principal Court Painter. While in Bordeaux, Goya began a set of highly experimental miniatures on ivory, creating haunting images. He also produced a large set of lithographs called the Bulls of Bordeaux, working like a painter on the large lithographic stones on a scale completely new to him. In these prints he was able to merge the qualities of painting, drawing, and print-making in a manner that makes these powerful images justly stand as his last masterpieces. Goya was buried in Bordeaux. His remains were exhumed at the turn of the century and taken to Madrid as part of a huge celebration commemorated with a statue of the artist placed at the north entrance of the Prado museum, in a plaza that still bears his name. Then interred in the Pantheon of Illustrious Men of the Sacramental Cemetery of San Isidro, he was finally laid to rest in 1929 in the church of San Antonio de la Florida in Madrid beneath his most ambitious mural program. While it is often said that Spain was at an economic and cultural nadir by the mid-eigh-teenth century, a mere shadow of the splendor and world dominance that had held sway in the previous century, its empire was never more vast nor its international bureaucracy more sophisticated and cosmopolitan. Spanish culture is often defined as if under a bell jar characterized in terms of a "golden age" and the inevitable decline from that moment whereas, of course, Spain has as restless and changeable an artistic history as any country. This is no better demonstrated than by the series of "reforms" that occurred shortly after Goya's birth, marked by the founding of a new arts academy in Madrid, the Royal Academy of San Fernando (of which Goya would one day become Director of Painting). 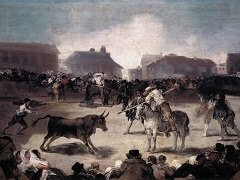 Eighteenth-century Spain was opened to a great range of international talent with three of the most celebrated artists in Europe employed there in public works during Goya's youth: Giovanni Battista Tiepolo from Venice, Anton Raphael Mengs from Dresden then Rome, and Corrado Giaquinto from Naples, also via Rome. 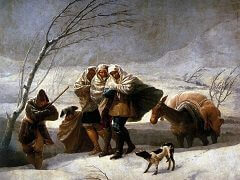 Goya's early work in Zaragoza with his future brother-in-law, Francisco Bayeu, introduced him to a charmingly suave and blended international rococo style much dependent on the work of Giaquinto, and it is this part of his training that probably encouraged Goya at the age of twenty-four to go to Rome for a year. Goya's early success seems to have come relatively easily, and he was involved with his in-laws in an ambitious set of new decorations for the cathedral of Zaragoza. Although he failed in his first attempts to win competitions at the newly founded Royal Academy in Madrid, by 1775 he was in the employment of the Royal Tapestry Factory of Santa Barbara in Madrid, designing series of tapestries that were the factory's principal productions over the next fifteen years. During this same time, Goya received his first commission to paint religious works and portraits, the latter from an increasingly more elevated group of patrons. By 1786 he was made Painter to the King, and, in I799, Principal Court Painter, a level beyond which an artist could not succeed unless he was elevated to the nobility, like Diego Velazquez, who preceded him in this post. Goya kept company with the most liberal aristocrats of the court, many determined to reform Spanish civil and religious life; these men and women became his patrons and often, true friends. 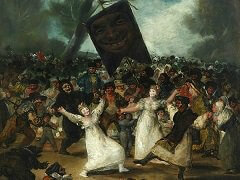 There is no evidence that Goya himself was active politically or even held strong political views. 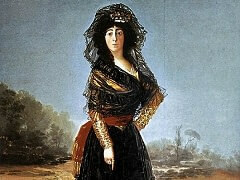 Through the ensuing war with Britain and the occupation of Spain by French troops, Goya loyally served two successive Spanish monarchs, Carlos IV and Fernando VII. While executing with great alacrity and swiftness the number of official commissions required of him, he also worked independently for other patrons and created works of art on speculation, often small paintings of horrific subjects, which sold very well. Printmaking provided him a serial form (not unlike the early tapestry productions) in which to explore a wider range of ideas, and he is justly ranked as one of the greatest printmakers of any century. Some of his prints were in part commercial ventured in 1803 Goya sold the crown the rights to reproduce his Los Caprichos in return for an endowment for his son while other prints were not published during his lifetime, never leaving the closed, very personal world that Goya, a highly public and civic figure, managed to retain his entire life. He had eight children by the same wife, Josefa Bayeu, only one of whom, Francisco Javier, survived to adulthood. He seems not to have been particularly loyal to Josefa but his affection for his son was profound and he made vigorous efforts to advance Javier's social status and property as his sole heir. 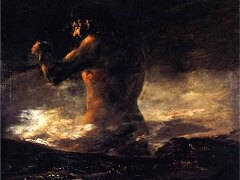 A severe and still incompletely diagnosed disease he suffered in 1792 while in the south of Spain left Goya completely deaf and, in many ways, cut off from his previous life. But it would be wrong to exaggerate as occurs in the case of Beethovem the tragedy of this isolation. 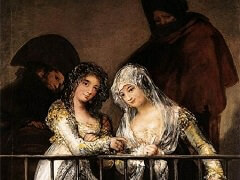 One of the most remarkable aspects of Goya's life is how successfully he retained friendships and, in fact, maintained royal and aristocratic favor. In turn, as evidenced by his retreat to France in 1824. the deeply oppressive quality of the restored monarchy in Spain following the French defeat in 1813 must have certainly pressed on Goya sorely. But perhaps political analogies to artistic patterns of creation are too facile. We have no notion of Goya's response to the opening in 1819 of the Prado museum as a public institutiom a moment of great liberality nor do we know what he thought of Fernando VII's suppression of a liberal constitution the following year. Today, along with Titian, El Greco, and Caravaggio, Goya is regarded both as the last of the Old Masters and the first of the moderns. The subversive imaginative element in his art, as well as his bold handling of paint, provided a model for the work of later generations of artists, notably Edouard Manet, Paul Cezanne Edgar Degas, and and through them Goya influenced some of the greatest artists of the 20th Century, such as Pablo Picasso. In his honour, Spain's main national film awards are called the Goya Awards.